I wonder if Snoop Dogg visits this blog, and if he does, what he thinks about my gratuitous, trying to be cool, hip-hop reference. This chocolate video features one of my rare forays into the world of candy. These chocolate coins are inspired by my love for the chocolate-salt-caramel flavor combination, and my fascination with edible money. To this day, if I'm in a store and I see those little mesh bags of chocolate coins, I immediately turn into a 5-year-old. Those foil wrapped chocolates were, for whatever reason, my absolute favorite. Come on, money and chocolate in one shiny package…beautiful. It also provided a valuable life lesson. I always thought the saying should have been, "you can't have your chocolate coins and eat them too." I mean who wants to keep cake around? It gets stale. Of course you eat cake as soon as you can - that's a no-brainer. Chocolate coins presented the real have-or-eat dilemma. Before you watch, let me say that I'm not a candy maker or chocolatiere. I didn’t really use a recipe, so if you are experienced in chocolate manipulation you very well may see errors in both technique and execution. I also didn’t bother to wrap them in gold and silver foil. I was very tempted, but time management and sanity prevailed, and I just piled them up. 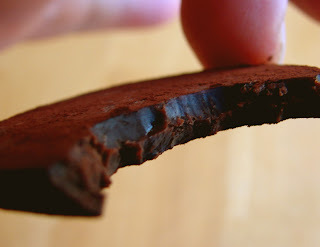 The chocolate I used was made by a company called Amano, which is quickly gaining a reputation as one of the top artisan chocolate makers anywhere. They are one of the few American companies that create their chocolate directly from the cacao beans. It's amazing stuff and I've included a link here so you can learn more, and hopefully taste it for yourself. Enjoy! Looks deceptively easy! About how many "coins" did this recipe yield? That looks gooood. First comment, BOOYAA! I love dark chocolate so much, so if those bars are as good as you say they are, I will have to get some! So far, my favorite dark chocolate has been the Dagoba brand "Eclipse," which is a whopping 87% cocoa! it made about 24, give or take a few "tests"
Hahaha... the end music, and the rabbit bird. This looks so freakishly good. I'm not all about dark chocolate, but mixed with caramel and sea salt... I warm to the idea considerably. Looks delicious and easy! I've had some amazing handmade ones made with real peanut butter (not Skippy) and dark chocolate. You make this look so easy to make. Now how many calories are in each candy coin? Don't even answer that because it looks too good to pass up because of a few calories. Grandkids are coming and it is something we can make together. Got those kids making stuffed artichokes and breading chicken cutlets. Now we can make chocolate treats. Never know what they are capable of unless you let them try. I'm so nervous about spooning every single coin on the mat. Will it harden before I can finish? Can I rewarm the chocolate then? Or maybe I could just make them into truffles? I just got rejected from a bajillion [the number is so absurd it isn't even a real number] that I need some serious good food to not feel oh so devastated. :D I would love to know some really awesome recipes. sorry, those bajillion breakups can be rough. sky, you'll have time, and if you don't, so what? It's all good in the chocolate ganache hood. "Bow Wow Wow Yippie Yo Yippie Yeah, Chef John's in the M*****F**kin' House"
Chef John, Granny says no pain no gain. Just in time! You do know those foil wrapped chocolate coins were recently recalled due to some contaminant, seriously! Thanks for the great recipe. We will make these again soon. I made these today and after an hour on the highest heat, the sugar still wouldn't melt in the double boiler. I had to do it in the pan. I was so frustrated that I forgot to add the heavy cream. They taste good though and I like the texture. If you watch the video again you'll see the sugar is not placed over water, it's in the dry pan over the flame. The chocolate is over the water. Check it out again. I made these yesterday! I had trouble getting the sugar to melt. It took almost 25 minutes and I still didn't have big bubbles. Sugar was placed in a dry pan over medium low heat (eventually moved up to medium). Question: Not a gas stove, and the pan was non-stick. Sugar was brown (not burnt) before I added cream. Was it the non-stick pan? I added in the cream when I finally had a LOT of little bubbles, but found that the sugar just wasn't hot enough to melt. Had to turn the heat back on (almost high) and stir constantly. This resulted in a lovely caramel sauce with tiny toffee fragments! I added hazelnut chunks and some caramel "beads" to mine as well, and they are GLORIOUS. Thank you Chef John! no, it was just the heat. My was med gas, so you may need med-high next time. And if you want it darker just cook longer. You shouldn't need to stir, as everything will stick to the spoon, until you add the cream. I made them...and all my friends LOVED them :-) so simple, so easy and very delicious....Thanx a Lot!! Can I use light cream instead of heavy cream? I used this recipie for easter and made big and small chocolate eggs and chocolate rabbits (I shaped them by putting the chocolate in a refrigerator bag, cutting a small hole in it, and then "painting" the rabbit on baking paper, then putting foil on it and making it flat with a big spatula). Then I used choco powder for 1 third, vanilla sugar for the 2nd and left the 3rd natural. haha, "It's not about being perfect its about .. eating chocolate" hahah. hey chef john, can you use wax paper instead of silicone ? That looks so delicious. Thanks for sharing! Not only am I already DROOLING, but now I'm craving chocolate even more! Thanks a lot, Mr. Chef, seriously, THANK YOU! They are delicious, but I'd like them to have a little more caramel... has anyone tried doubling the sugar and cream to get more caramel? These were amazing and so easy! These look wonderful. I love the flavour combination of caramel, salt, and chocolate. I am very interested in stamping a picture of my face into these as suggested. How would I go about making the stamp? Could I use a potato? If I send you a photo could you draw a picture for me? I made these as described but didn't taste any caramel. Everyone said they just tasted like sea salty chocolate (luckily still yummy). Also the next day they tasted kinda grainy. What did I do wrong? would it be OK to use this as a base for making truffles? Sure! All these are are flat truffles. Do you think I can allow my 13 year-old nephew to make these on his own? He does know some basic recipes and can make your mocha pot de creme without a sweat. It's just awesome! Tastes great, and I had to let my nephew come over a few times just because I was craving it! not sure, but caramelized sugar is VERY hot and can be dangerous. Hey Chef, going to make this tomorrow. When you say i need to shape it into coins kind of quickly does that mean they could harden if you don't shape it quickly? Going to make this for my closest friends and my crush. Thanks. Chef John, my chocolate coins are to liquidy to shape? Can the temperature in my house affect the ganache? I live in a tropical place and today is hotter than usual. Should i use air conditioned place then to shape them? No shouldn't be a problem. I really can't tell you. Put and spoon in the fridge and see if it firms up. I'm 13 and have no experience in cooking whatsoever. Holidays are coming and I want to try cooking some easy food and desserts with my friends (also no experience), could I try this or do you think I will mess it up..? ^^" If you think I will then any recipes to recommend? Hi! I just tried making these but I think our gas stove gets too hot. The sugar didn't take 7-8 minutes, maybe 1-2 and the edges were brown before the middle. On our lowest setting! Mixed it anyway, we'll see what happens when I pull them out of the fridge. I just made these with the Ocumare. 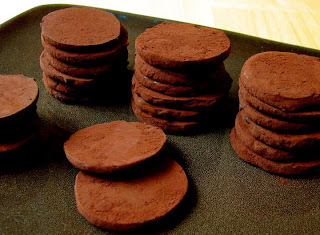 These are pretty easy to do and are chewy yet still solid. I also like them without the coco coating slightly better. Chef John, can I use Pure Cream (45% milk fat) for this? Or heavy whipping cream? I made these tonight, and they're tasty, but when I was making the caramel, the sugar solidified into a large glop of hard when I added the cream. Is this supposed to happen? It eventually melted and reduced, while sticking horribly to the spoon. I made them today, but I think it could be more toffee in my mixture. I am from Europe so I translated into gramm and ml: 13 gramm sugar and 60 ml cream for 170 gramm chocolate - especially the sugar seems to be undercharged. I definitely have to buy some cup-measure-cups and will take more sugar next time. But the Ganache came out really clean and beautiful as it should. Whomp there it is...I think I just found my next macaron filling it just has to work. Thank you sir for upping my kitchen ante! How long do you think these would keep? I want to make a few batches and give them away for the holidays. Should I keep them in the fridge/freezer, or is room temp OK? Thanks, they look awesome :). I like to keep refrigerated. Don't know exact time since never kept very long, but for a week at least. I wanted more caramel flavor, so I used about 3 Tbsp sugar instead of 1 Tbsp. I kept the other ingredients the same. I also pushed the caramelizing as long as I could, right up until the edges started almost burning. Yum! Will this recipe work with milk chocolate, or will that be too sweet? Could egg nog be used instead of heavy cream? UPDATE: I'm Stuck in Flagstaff! !